1. Combine the pork ribs with the marinade sauce (1), set about 10 mimutes. 2. Then mix the pork ribs with the starch (2), set about 1 mimutes. 3. Heat 2 tablespoons oil in the pan at medium-high heat. Add the ginger first then stir in onion, stir together for half a minute,or until onion is translucent. 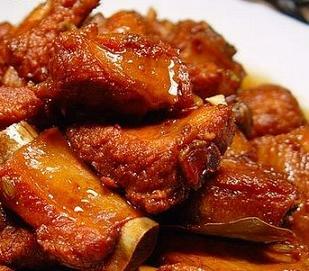 4、Add the pork ribs and continue stirring for about 2 minutes,until the pork ribs turn lightly brown on both sides. 5、Then add the rest of remained marinade sauce (1),and sauce (4),stir a few times,then cook at medium heat with cover until one third of the sauce is left. 6、Add the carrots and peppers,stir a few times, cover then cook until the meat is tender and the sauce starts to thickene slightly, ( add 1 tsp. Chinese aromatic vinegar for better smell and taste), now it is ready to serve. Enjoy!